In what might&apos;ve been a scene from one of the Mission Impossible movies, California deputies shot and killed a suspect from a helicopter after he drove more than 100 mph the wrong way down a freeway to avoid police. The suspect died at the scene, Buzzfeed News reports. Apparently the high-speed chase began when authorities tried to pull the suspect over because he matched the description of a suspect in a previous armed robbery charge. The suspect refused to stop, leading to a car chase that reached action-movie speeds. The chase, "wound through the cities of Fontana and San Bernardino before the man headed south on the northbound 215 Freeway." Never a good idea. After a period of time the suspect jumped out of his still-moving car, which promptly collided with another vehicle. All three of the other vehicle&apos;s passengers were sent to the hospital. 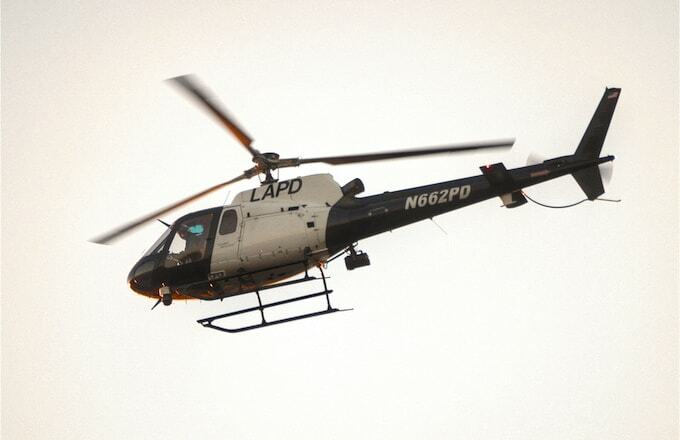 Meanwhile the fleeing suspect was shot from a police helicopter that had been following the chase overhead. He was pronounced dead at the scene. Patrick Healy, a reporter for NBCLA, posted a series of photos from the scene. Although police wouldn&apos;t confirm whether they opened fire before or after the suspect jumped from the vehicle, Healy points out a series of bullet holes that appear in the suspect&apos;s windshield, which seems to indicate that police opened fire while the car was moving.